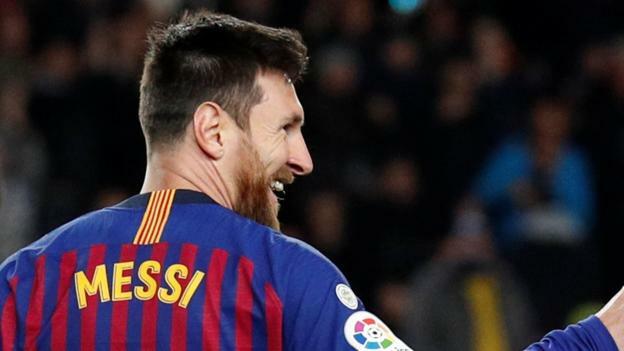 Lionel Messi scored his 400th La Liga goal as Barcelona beat Eibar at the Nou Camp to regain their five-point lead at the top of the table. Messi, the all-time leading scorer in the Spanish top flight, finished into the bottom corner for Barca’s second. The landmark goal comes in the Argentine’s 435th league game. Luis Suarez earlier put Barca in front by finishing a fine team move before tucking in his side’s third in the second half. Messi, who becomes the first player to reach 400 goals in one of Europe’s top five leagues, could have scored a second but he shot straight at Eibar goalkeeper Asier Riesgo from the edge of the box. The victory takes Barcelona five points clear of second-placed Atletico Madrid. Real Madrid are 13 points behind in fifth but the European champions will move into the top four with victory over Real Betis later on Sunday (kick-off 19:45 GMT). Messi was quiet for much of the game with his goal coming from his first shot. The 31-year-old is only the second player to reach 400 goals across Europe’s top five leagues, following on from Cristiano Ronaldo who has scored 409 league goals 507 games in England, Spain and Italy. The goal against Eibar means Messi has reached 400 goals 63 games quicker than Ronaldo reached the same milestone. It also extends his lead as La Liga’s all-time leading record scorer with Juventus’ Ronaldo second having scored 311 goals in 292 games at Real Madrid and Telmo Zarra, who scored 251 La Liga goals third.